The proliferation of non-native plants, and the unnatural spread of some native plants, leads to multiple impacts that affect the overall biodiversity of our region. They have dramatic effects on soil quality, water flow characteristics and quality, aquatic flora and fauna, and ecosystem processes. They occur in terrestrial systems from savannas, scrubs and rainforests through to aquatic areas such as riparian zones and wetlands. Riparian zones are especially susceptible to colonisation and spread of certain weeds because water and nutrients are in greater supply in these areas. Weeds have been introduced either historically as a food source for humans and livestock, or as gardening plants that subsequently spread into natural environments. Illegal dumping, especially of household green waste in natural areas, helps to spread weeds and diseases into rural areas, which can significantly impact on the natural ecology as well as the productivity of agricultural enterprises. impact on agriculture and other industries. The Biosecurity Act 2014 provides the statutory direction for managing pests in Queensland. However, the resources available for managing pest plants and animals are limited in contrast to the enormous costs of the pests. Collaboration and alignment of effort are key to ensuring that we maximize the value of those resources and support land managers to control pests on-ground. 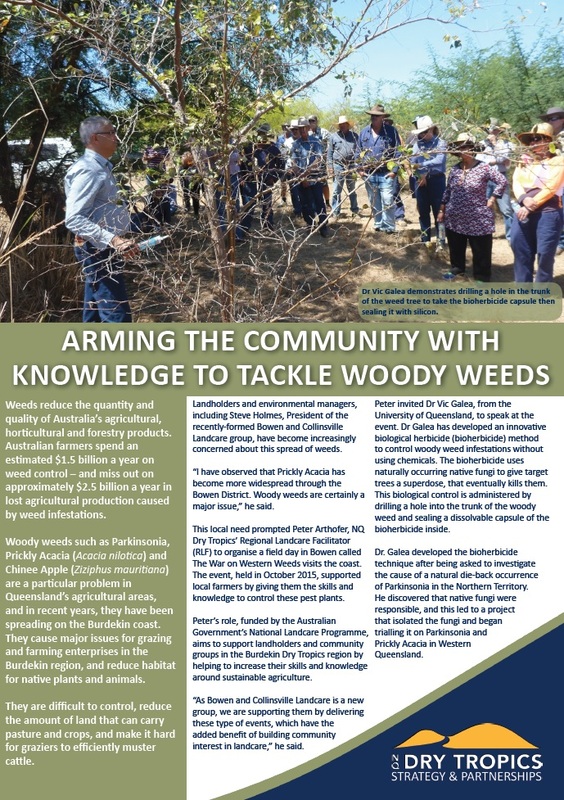 In the Burdekin Dry Tropics , a Regional Pest Management Group (RPMG), whose membership includes landcare and industry representatives, infrastructure managers, and local and state governments, oversees the strategic and collaborative delivery of the Regional Pest Management Strategy (2014-2019). 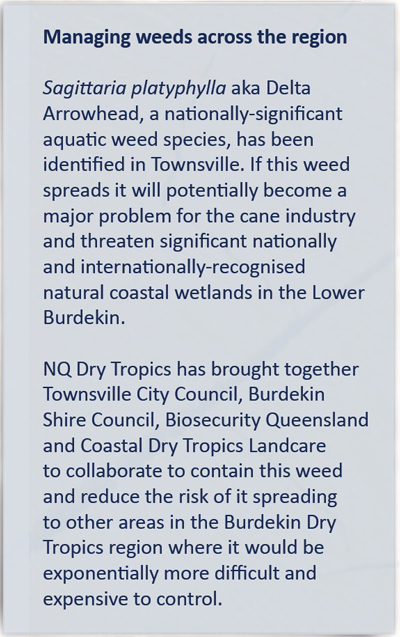 The group prioritises our region’s pest plant and animal management efforts at a landscape level and across local government boundaries to maximize the effectiveness of limited resources (NQ Dry Tropics, 2014). Atlas of Living Australia. (2012). Weeds of National Significance. Department of Agriculture & Fisheries (2016). Weeds of National Significance (WONS). Mitchell, J. (2011). Exclusion Fencing of Feral Pigs. Mitchell, J. (2011). Poisoning of Feral Pigs. Mitchell, J. (2011). Shooting/Hunting of Feral Pigs. Mitchell, J. (2011). Trapping of Feral Pigs. NQ Dry Tropics. (2014). 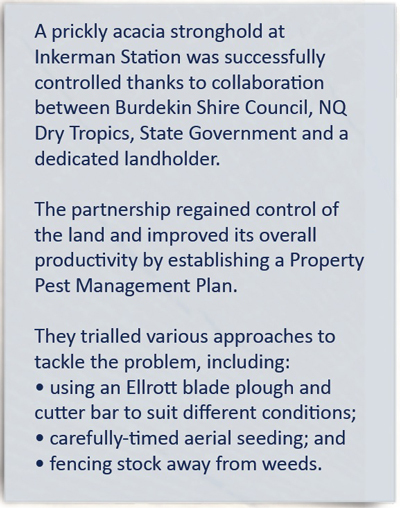 Regional Pest Management Strategy for the Burdekin Dry Tropics 2014-2019. NQ Dry Tropics. (2016). (Revised). Weed Free.